He welcomed her to the world in April. 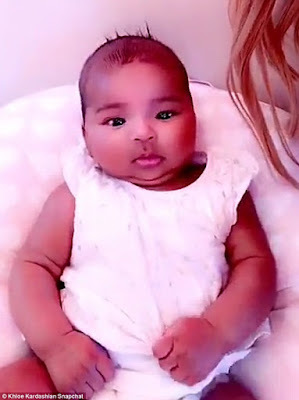 And Tristan Thompson appears more and more enamoured with his and Khloe Kardashian's baby daughter True as the days go on, as he shared a video on Instagram while playing with the adorable tot. Clearly madly in love with his little girl, the Cleveland Cavaliers player, who is also father to 19-moth-old son Prince, larked around with True before cooing: 'Do a little dance, baby', while clad in his basketball kit. Tristan could not tear his eyes off his little girl as they danced around the lavish living room while he tenderly sang to the tot in a sweet display.